I don’t mean to get personal here, but do you have a leaky sales funnel? Are you losing some customers somewhere along their journey from initial contact to final sale? Or is your sales funnel fully clogged, in need of middle-of-the-night emergency attention that’s costing you a fortune? Either way, I’ve got you covered—no charge—because either way, it’s all about your content. Compelling content propels people down your sales funnel faster, increasing your velocity—which should be a KPI for all CMOs. If you do not have an accurate gauge on your velocity, the rate at which a customer or prospect moves through your sales funnel, you are losing money. Guaranteed. An overly-short sales funnel does not offer enough to court and convert, while an overly complicated or clogged one can confuse customers who would otherwise pay off. 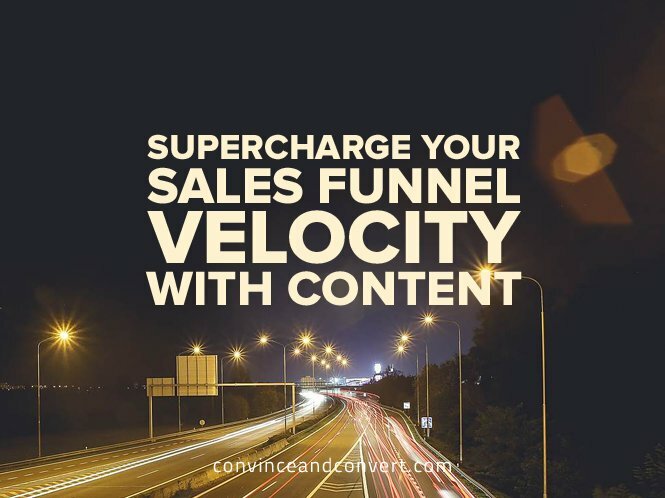 The secret to increasing your velocity is to craft compelling content for each step of your sales funnel. They will stay with your brand if you deliver what they want when they want it. And it should be customized for your buyer personas. Here are some suggested content ideas for each stage of your sales funnel. Blogging attracts visitors and traffic to your website; it is a key deliverable for the top of your sales funnel. Every time you write a blog post, it counts as another indexed page on your website, which improves your rank with search engines. Blogging also gives you exposure on social media sites, which dramatically broadens your audience. Topics should be timely, delivered frequently, and, most importantly, relevant to your customers and prospects. 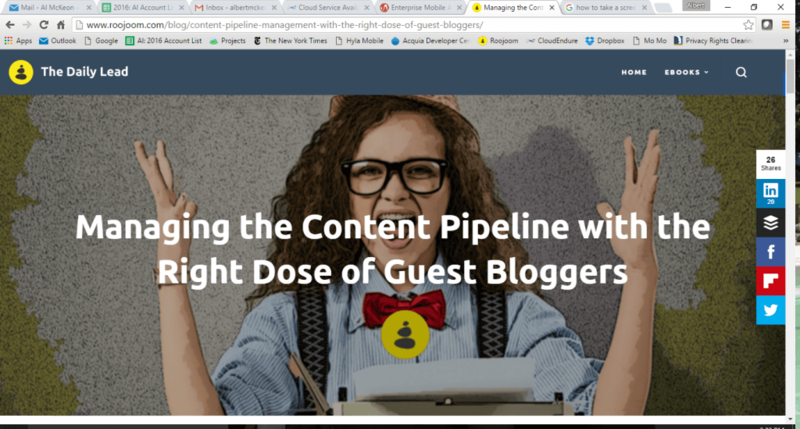 Not to toot our own horns—but we will!—here is a blog post from the Roojoom team that attracted considerable attention: Managing the Content Pipeline with the Right Dose of Guest Bloggers. If people were unaware of, or uncaring about, the content pipeline, then surely a post about guest bloggers got their attention. It’s difficult coming up with new blog posts on a regular basis, so many organizations rely on guest writers to help fill in the calendar. This post delivered sound advice on how setting the right guidelines for guest bloggers will attract new readers, rather than confusing and losing them with the many mixed messages that come from several writers with varying interests and aims. When your budding audience takes the next step, they are looking for more in-depth content. Offer them a case study; 54 percent of marketers believe it is the most effective form of content marketing. Present a challenge that will pique your audience’s interest and showcase your solution to keep them moving in the right direction. Philips Color Kinetics shines a light on its products with a bright case study on how the company’s LED nodes for large installations beautified the entranceway to a new headquarters for DIRECTV. 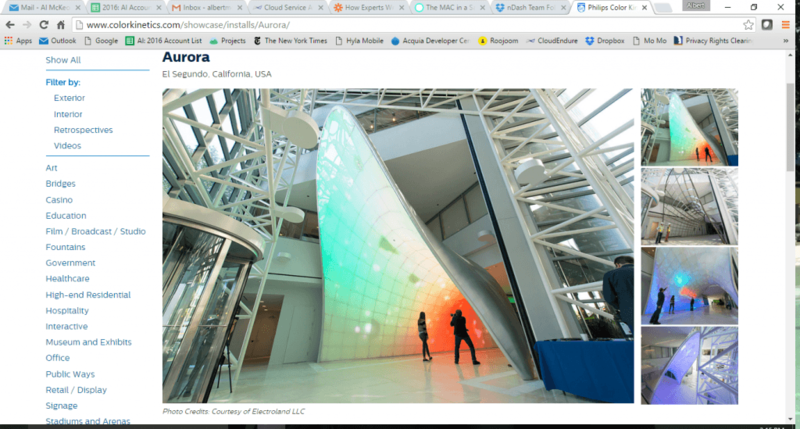 The case study dazzles with sharp photos and succinct text describing the project and product. To further nurture and nourish your leads, consider a webinar. More than 60 percent of marketers use webinars to convert. To maximize webinar ROI, make sure you delve into a topic with search potential; thoroughly promote it well in advance through multiple channels, including your website and social media networks, and don’t be afraid of your own pitch (it is expected; don’t apologize for selling on a webinar). 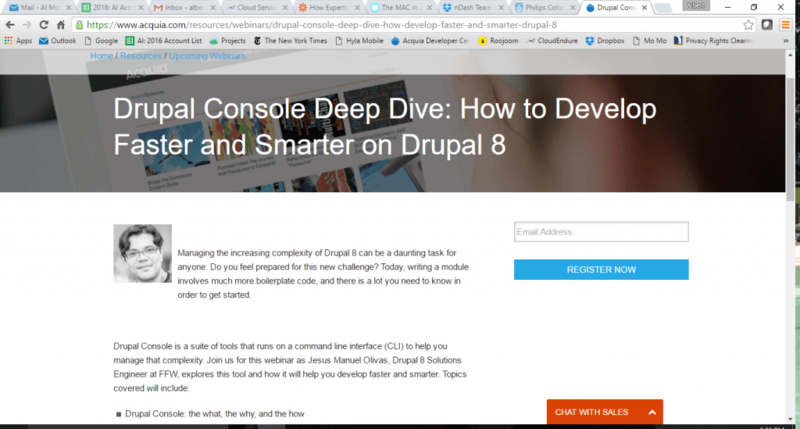 Acquia, a SaaS company that helps organizations manage their CMS platforms, consistently offers informative webinars on Drupal, the open-source Web content platform that is the backbone of Acquia’s offering. After Drupal’s major upgrade to its eighth version last year, Acquia has been offering webinars on how to best use the new set of Drupal tools—a great example of lead nourishment, even if it’s a bit technical for this humble marketer. Statistics show that whitepapers are the best way to further differentiate your brand and keep customers’ attention at this stage of your sales funnel. Whitepapers are the most requested form of content; they are preferred by 78 percent of B2B buyers. Writing a good one is no small task; it needs to be about 10 pages long, professionally designed, and rich with statistics, charts, tables, and references. Whitepapers are not a drive-by read. People expect you to put the time in so they feel equipped to make their decision. Do not let them down. You are so close to a sale! 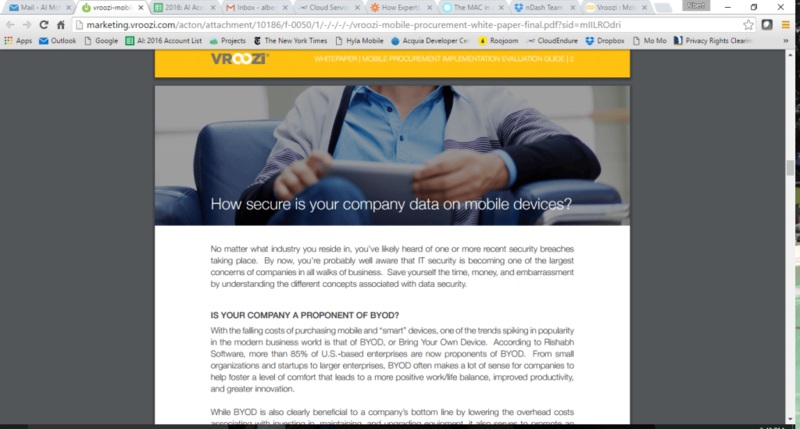 Vroozi, a mobile procurement platform for companies looking to improve procurement and spend management, offers a 14-page whitepaper that is sharp, easy to read, lays out text in manageable chunks, and makes good use of photos. The whitepaper (Mobile Procurement Evaluation Guide) details why and how procurement can be effectively managed from a mobile device. By the end, potential customers have a deep understanding of how mobile procurement not only saves time and money, but how it also empowers individual employees to shop as they do in their personal lives and thus do the same for their employers. Once you’ve outfitted your sales funnel with the right content at the right stage, make sure you tailor Google Analytics accordingly. Google Analytics gives you the ability to track your customers through each step of the sales journey. It shows you points along the way where different customers drop off, delivering the insight you need to increase your sales funnel velocity. Every CMO should measure funnel velocity as a KPI. You can start by feeding into your CRM the original date a prospect first visited your site. I built a dashboard in SalesForce that shows the average time spent on each funnel stage for each customer persona. The way I see it, my content team has only two functions: to attract relevant audiences and to help move them down the funnel as efficiently as possible. The Funnel Velocity KPI relates to them just as much as it does to sales, email, and lead-gen.
Do you measure sales funnel velocity as a KPI?